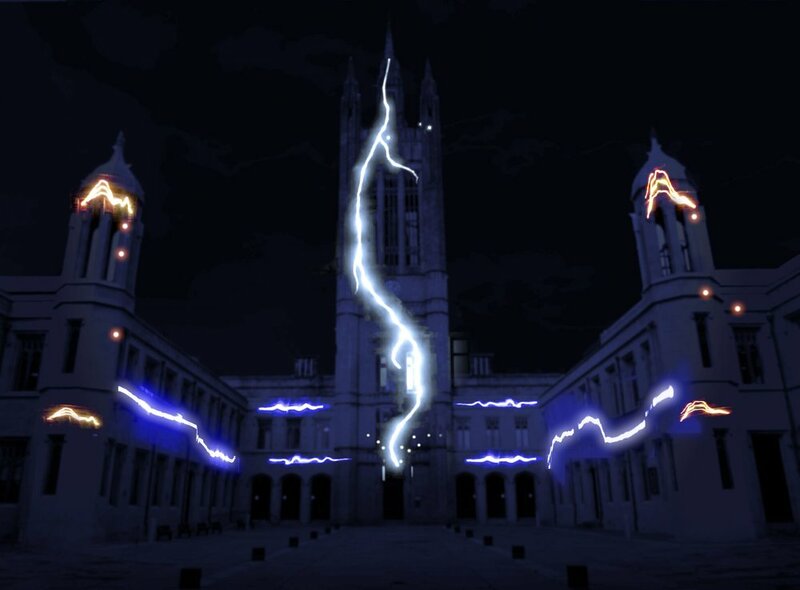 Lightning Strikes is a brand-new Curated Place commission in cooperation with SPECTRA Aberdeen, Seb Lee Delisle's Lightning Strikes is a large scale laser-projected environment that invites visitors to experience bolts of lightning jolting from the tower of Mitchell Hall and transforming the Marischal College Quad in dramatic fashion. Seb Lee-Delisle is a digital artist and speaker who specialises in large scale interactive light installations. His work is a celebration of technology that encourages interaction and playfulness from the public. Drawing on his previous experience as a game programmer, he works with electronics, lasers and high power projectors to bring his artworks to life. Notable projects include Laser Light Synths, super bright bespoke synthesisers with laser visuals for the public to play, and PixelPyros, the Arts Council funded digital fireworks display that toured nationwide in 2013. Original photo of Marischal College by John Lord and adapted for this mock-up under Creative Commons Attribution 2.0 Generic License.